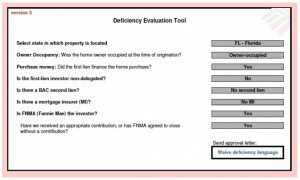 The “Deficiency Evaluation Tool”, or DET. Wow that has a high-tech ring to it doesn’t it? Sounds pretty important. Turns out it could be. 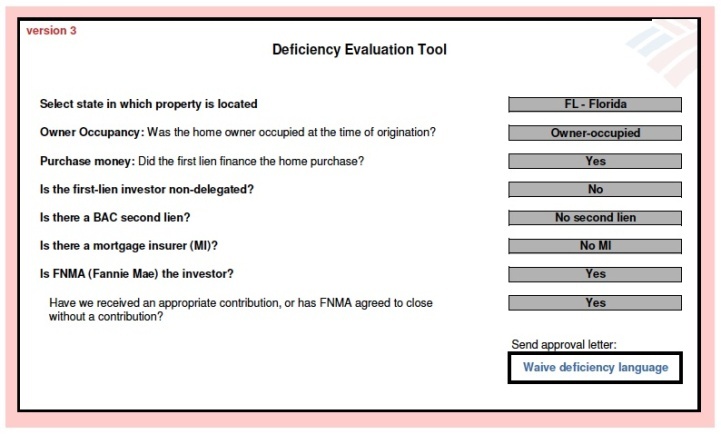 From what insider sources have told me, this is what Bank of America is using to determine whether their short sale approval letter will have any “deficiency” language in it. What’s that mean, you ask? Well, if a bank approves your short sale, on the approval letter they reserve the right to include verbiage that allows them to come back at a later point and ask for money from the you, the seller. How likely is that to happen? Hard to say, but you can see below what the criteria is for this and what factors are likely to sway them in one direction or another. Things such as was it owner occupied, who is the investor, was it purchase money loan, etc. Well, the good thing about living in California besides the weather is the California Civil Code of Procedure, Sections 580a through 580d, which state that under certain situations, California is an “Anti-Deficiency” State. But, you have to meet certain criteria, such as it must be owner-occupied, must be purchase money loan, and more. We always suggest talking to an attorney before pursuing a short sale, and then you can again consult with your attorney about the specific verbiage included in your Bank of America or other lender’s short sale approval letter. Since short sale approval letters vary from investor to investor, we don’t if deficiency language will be included until the bank has reviewed the seller’s short sale package, but keep in mind you always have the opportunity to review the letter before you agree to accept their terms.